Say hello to a good buy! That's the motto of Tony Hill, who celebrates 35 years as a trader on Bury Market this month. 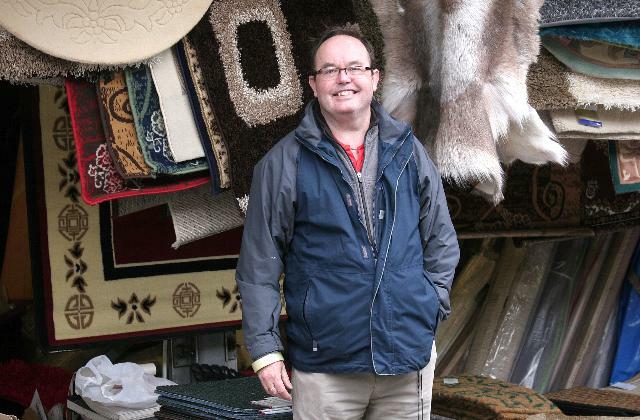 Tony sells carpets, rugs, cushion floor and cushion vinyls from his Gable 1 Stall every Wednesday, Friday and Saturday, like he has been doing since March 1982. His first involvement with the market came several years earlier when he started work as a 'packing up lad' in 1971 for Morton's Carpets. Tony grew to enjoy the market's hustle and bustle and the interaction with the various characters it attracted. Tony said: "I never planned to be a market trader - it just happened and it's something I have never regretted. In my time on the market I have seen many changes, some good and some not so, but one thing that has never altered is the fact that you'll have to go a long way to find a better market than this one!" Tony's talents don't end at market trading. "My parents always insisted I had to educate myself, so over the years on a part-time basis I have gained two Honours degrees, one Masters degree and a Diploma in cognitive behavioural therapy. I have worked as a volunteer in alcohol rehabilitation and now work two days each week for a company as an alcohol and drug therapist." Tony is an active member of market life and has a long history of involvement with the Bury Market Traders Association, of which he is the current chair. Markets manager Andrew Heyes said: "Tony is the epitome of a market trader: he has never missed a market day for as long as I have known him, regardless of the weather, and is a real asset. I hope he continues to trade with us for many years to come!"